Maurice was educated at Elstree and Repton, and at the London Hospital, where after winning a prize in clinical medicine, he qualified M.R.C.S., L.R.C.P. in 1912. He held the appointments of house surgeon, house physician, and receiving room officer, and it was stated that he showed promise of every success in his profession. He was also remembered at the hospital for his share in organising and performing in the Christmas entertainments. On the outbreak of war Maurice joined the Red Cross and with his friend, Captain H W Kaye, R.A.M.C., organised a hospital at Chateau Laversine, which was a place at the disposal of the British Red Cross Society by Baron Robert De Rothschild. A large number of French and British wounded were treated there until the advance to the Aisne caused the hospital to be evacuated. They both then returned home, joined the R.A.M.C. and were posted to the 43rd Field Ambulance. After training at Aldershot they went with the ambulance to France in April 1915. In the August Maurice became attached as Medical Officer to the 2nd Bn. Royal Irish Rifles, and was with them in the trenches during the attack of September 25th, and remained with them up to the time of his death, which occurred while he attending to a wounded man under fire. 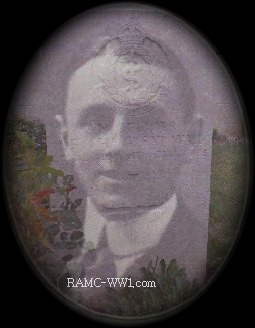 After Maurice was killed, his friend Captain H W Kaye, R.A.M.C. wrote to the London Hospital Gazette:- � Many friends and contemporaries of Maurice Mackenzie must be mourning his death, and, therefore, I send you this short account of his War Service, as it was my privilege to serve with him throughout the greater part of it. At the beginning of September 1914, he went to France with the 2nd British Red Cross Society Unit, and contributed very much to the success of the 90 bed hospital of the Society at Laversine (near Chantilly): this hospital did good work both for our own and the French wounded during September, October, and part of November-a time when such help was of great value to the hardly-pressed resources of the Allies in dealing with their casualties. During November and December he took an active part in the organisation and equipment of the B.R.C.S. No. 1 Mobile Hospital, which was destined to work for the French, but never actually came into operation. Just after Christmas, 1914, he came home, and having terminated his engagement with the B.R.C.S., took a commission in the R.A.M.C. After a short period spent in training at Crowborough, he was appointed to the 43rd Field ambulance, then in training at Crookham. In the middle of May the Division was dispatched to France - the 2nd Division of the New Armies to go - and after a few weeks was sent up to work in the famous Ypres salient. About the third week in August, Mackenzie was transferred to the 2nd Royal Irish Rifles, and was still serving with them when he met his death on Advent Sunday. He was a first-rate Field Ambulance Officer, both in the routine of training at home, and also in active service in the field out here, and no one could have shown more keenness and efficiency in the various duties that fall to the Field Ambulance Officer. Quite apart from his professional skill and thoroughness, he made a great and enviable reputation among those with whom he worked out here (and they are the people who know what a man is worth) for the courage and cheerfulness he showed when things were �strenuous� - the courage that is quite unostentatious but unmistakable and beyond price. Many will remember the splendid work he did when the Ecole Dressing Station was shelled and set on fire, as well as the invaluable three days and nights he spent in and near Railway Wood early in August with his bearer party on an occasion which none of us will ever forget. Such a bare statement may convey little to the reader's mind, but those who were there know how much his presence and example meant in more than merely medical ways, and what excellent work he did for the wounded there under most trying conditions. Of his work with the Battalion I can only speak at second hand, though - knowing him as I did - I am confident he was a first-rate regimental medical officer. Among the officers and men of his regiment there was clearly only one opinion, and it was obvious that he had completely won their respect and affection as well as their confidence. The adjutant-his great friend in the battalion- sent me word of his death yesterday. It appears that on the morning of the 28th, news was brought to the R.I. R. Headquarters that a sapper officer had been badly wounded, and was lying about half a mile away. Mackenzie at once went off with his sergeant and stretcher-bearers, and arrived to find the wounded man had been removed from the trench to the roadside. He proceeded to examine and dress him, and while he was doing this a shell must have pitched right among the party, for they were all killed except the patient, who was wounded again. Mackenzie must have been killed instantaneously. We buried him yesterday alongside his sergeant in the French cemetery, amid the roar of our guns. He died a true soldier-doctor's death, literally doing his job, and thinking only of his patients. The "London" may well be proud of such a son; all those who served with him out here are mourning the loss of a most faithful and courageous friend, and extend the truest sympathy to his family and all his friends at home.� A Stretcher-Bearer, F Kane of the 2nd Royal Irish Rifles wrote of Maurice:- �"We had a working-party repairing a trench, and while they were at it a German aeroplane was hovering over-head and gave the signal to the German gunners. A couple of shell came over and two men were killed, but the Engineer officer told them to go on working. A minute afterwards another shell came over and broke the Engineer officer's leg and wounded some more. By the time we got up, the men had left the trench and carried the Engineer officer across some fields to the road. The Sergeant wanted Lieut. Mackenzie to stop behind some houses until we could bring the wounded officer to him but he said he would go up himself to where the officer was lying, and told us to wait behind the old houses until he had dressed the officer. While Mr. Mackenzie was dressing the Engineer officer, a shell burst a couple of feet away from them and Mr. Mackenzie got hit on the spine with a large piece of shell and died immediately. The Sergeant of Stretcher-Bearers got hit in several places, and died being carried on the stretcher. The shell did not hit the wounded officer; he escaped marvellously, but died of wounds several days later." A friend with whom he worked with also wrote of him:- �We cannot serve with him for any time without realizing how admirably suited he is by temperament, and indeed in every way, for active service. To my mind he is just the type of man who is the backbone of our army out here, high praise you will say, but I mean it. No one could wish for a more loyal and trustworthy man to work with.� And again, after his death: �All the officers and men I spoke to were more than fond of him and feel his loss intensely.� His commanding officer wrote of him to Lady Mackenzie: �Your son was a great favourite and a cheerful companion, with a very high sense of duty. We lose a great friend and I and the battalion lose an ideal medical officer.� Maurice was the youngest son of the late Sir Stephen Mackenzie and of Lady Mackenzie, of �The Croft.� Dorking, and a nephew of the late Sir Morell Mackenzie.